When it comes to pasta, I typically enjoy eating it with homemade meat or marinara sauce. You can blame that on the fact that I’m half Italian and that’s how my mom made it for us when I was growing up. I rarely make anything with white/alfredo sauce (much to the chagrin of my husband, I’m sure!). Pesto, I do enjoy, but save for only certain pastas because of its consistency and garlicyness (is that even a word?). I feel that I could keep away any vampire after eating it. While doing research on garlic scape recipes, pesto kept popping up as a ‘must-try’ by magazines and food bloggers alike. A combination of scapes, olive oil, and some type of nut. I knew that I had to try this out. Most of the recipes that I found only used scapes, and no basil. However, I wanted to use the basil in this week’s CSA (as the other went bad before I could finish it), so this was the perfect way to do so. I plan on eating this in another day or so, atop of some tortellini that I bought this week at the store. In a saucepan, toast the pin nuts until they start to lightly brown. Remove from heat. 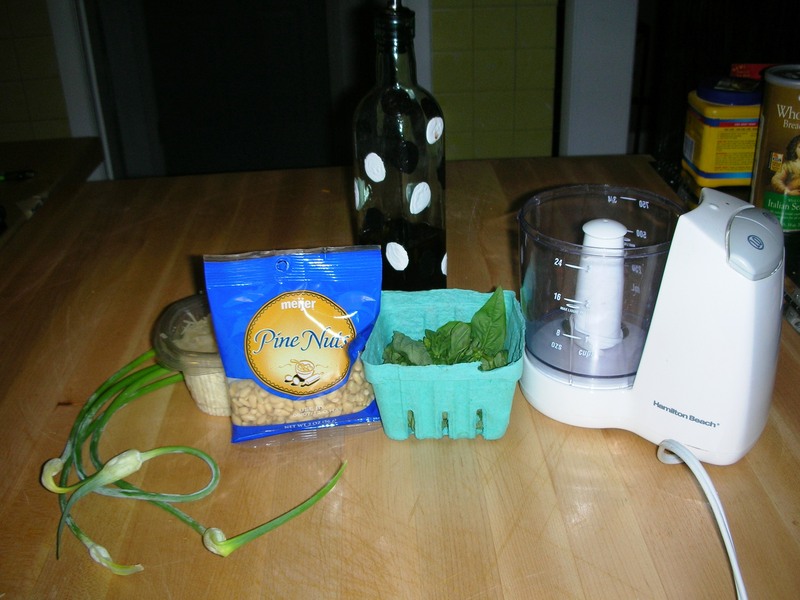 In a food processor (or blender), add basil & scapes. Mix, and add oil to emulsify. Once mixed, add nuts and salt. Process until the mixture forms a paste, adding olive oil if needed. Add parmesan cheese (and again, more olive oil if needed) and pulse until combined, to the consistency that you wish. Store in a sealable container, for 3-5 days. I was very pleased by the flavor of the pesto. 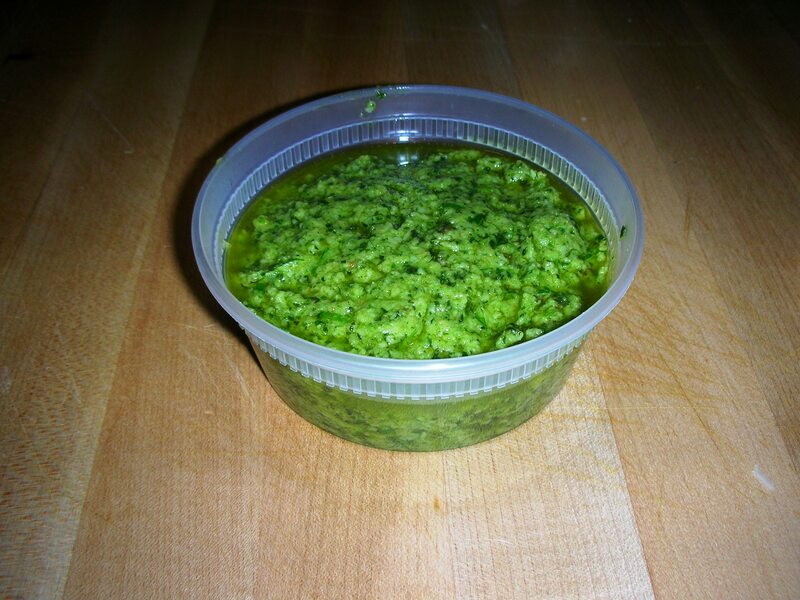 It had all aspects of a ‘typical’ good pesto, but wasn’t nearly as garlicky. The flavor was really nice as well; the spiciness of the garlic hits you right away, but is mellowed out quickly by the oil and parmesan. I would definitely prefer this recipe any day, over the jar of mass-produced, store bought pesto sitting in my refrigerator. Homemade is the way to go! Question of the Day: On your pasta, which do you prefer the most – red sauce, white sauce, or pesto? Garlic Scape & Basil Pesto. I especially love how bright, fresh & green it looks! I love red sauce and pesto but I really love pesto on pizza. I just made pesto for the first time a couple of days ago! We got two huge bunches of basil from the farmer’s market and it was the best way to use one of them. I have never tried garlic scapes but I love anything garlic so, YUM!